A plaque commemorates the explorer Major Thomas Mitchell who explored the area in 1832. After his expedition in 1832 settlers quickly moved into the region. Andrew Doyle and Patrick Quinn were among the first Europeans to take up runs in the district. The plaque was officially unveiled during the 2005 New England & North West Regional Historical Societies Conference. In 1831 a runaway convict George Clarke, who had lived with aborigines in the area for several years, claimed that a large river called Kindur flowed north-west from the Liverpool ranges in New South Wales to the sea. Charles Sturt believed that the Murray-Darling system formed the main river system of New South Wales and Mitchell wanted to prove Sturt wrong. Mitchell formed an expedition consisting of himself, assistant surveyor George Boyle White and 15 convicts who were promised remission for good conduct. Mitchell took 20 bullocks, three heavy drays, three light carts and 9 horses for supplies and transport, and set out on 24 November 1831 to investigate the claim. 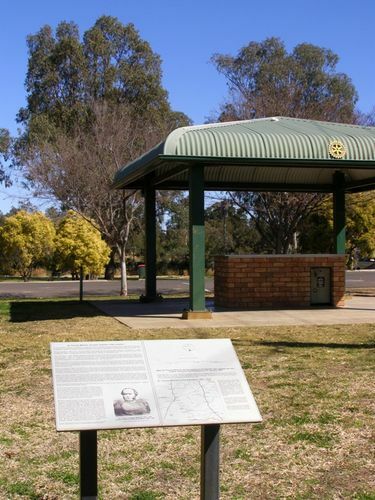 In early January 1832 he was in the vicinity of the present town of Narrabri, reached the Gwydir River in mid January and found the Barwon by the end of the month where he set up camp. Mitchell left the main party and made a reconnaissance down the Barwon until he found its junction with the Gwydir.